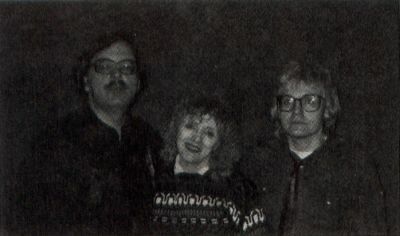 Arnie Katz, Bill Kunkel and Joyce Worley are synonymous with computer entertainment journalism. The trio has covered electronic games for leading publications. The main reason for the conntiued existence of the ST software pipeline is the proliferation of European games into the United States. The Winter 1989 Consumer Electronics Show proved that there is still blood (as in entertainment software) pumping through the Atari ST's veins. U.S. publishers talk a discouraging line regarding the ST, and virtually no software is developed on it in this country. Nonetheless, there were still some three dozen ST game/entertainment titles either previewed or announced at CES. Unlike the C64-128 and Apple II—the other systems being treated by software publishers as if they have halitosis—the ST's 16-bit technology allows for easy conversion from Amiga versions. As a result, the ST has ironically reaped spill-over benefits from the belated success of its rival. But the main reason for the continued existence of the ST software pipeline is the proliferation of European games into United States. Where once only the very best British and Continental titles made the migration Stateside, European publishers now do a brisk business in U.S. rights. The ST is very popular with European users, as well as a preferred development system for programmers. Many of the titles acquired by U.S. publishers already exist in ST format, therefore, and there is no reason not to release them. Whatever the reasons, we have 40-plus new ST titles to deal with—from arcade shoot-outs and adventures to sports simulations and classical board and card games—so let's get to it! Arcade and arcade-style games continue to be a popular category for the ST. Elite, a leading European publisher, displayed ST versions of Capcom's Ghosts ‘N’ Goblins, Atari's Paperboy and Sega's Space Harrier II, in addition to its own action game creations. Elite's product is strongly reminiscent of Nintendo's, with an emphasis on side view, horizontally scrolling action games like Beyond the Ice Palace and Thundercats, based on the animated TV series. Elite also showed a couple of more sophisticated titles. Live and Let Die is a James Bond license that strings together several action games based on sequences from the film, primarily the motorboat chase. Overlander, meanwhile, is a fairly slick-looking driving contest that affords the player the ability to earn money and enhance the vehicle grafted on. Taito, the longtime Japanese coin-op giant, will be entering the U.S. software fray with top-notch versions of the arcade hits Alcon, Arkanoid, Bubble Bobble, Operation Wolf, Qix, Rastan, Renegade and Sky Shark. Best of all, each and every title will be released on the ST! Titus Software, the folks who brought us Crazy Cars, will be back with several new action titles. 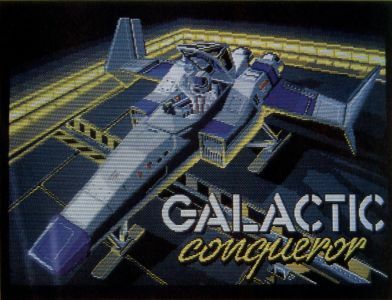 Galactic Conqueror is basically Crazy Cars in outer space with weapons. 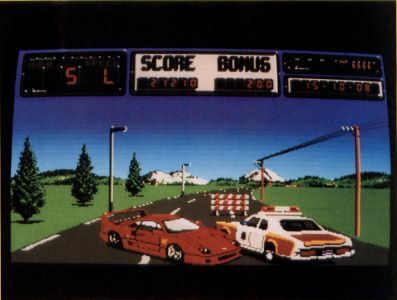 F40 Pursuit Simluator, meanwhile, is a cross between Crazy Cars and Test Drive (Accolade), even though it sounds like a flight simulator. And Titan is an action-strategy contest with 80 levels of fascinating and difficult puzzles. Perhaps the hottest new action game for the Atari ST, however, is the visually stunning Savage. With graphics so hot they practically singe the screen, Savage is actually three games in one: an angled side-perspective scenario with horizontal scrolling, a pseudo-first person game and the final challenge, which combines horizontal and vertical scrolling action. There are traps to avoid, weapons, treasure and magical artifacts to collect, and a first-rate gaming experience to be had by all. Savage should be available from Rain-bird by the time you read this. Another high-end action game is Japan's Silpheed, which will be published in the U.S. by Sierra. Silpheed places the user inside a super dogfighter with which he must defend the good space empire from the evil space empire. Silpheed boasts 20 levels, 30 different enemy ships and nine original musical compositions. An action game of a different color is Ringling Bros. Barnum & Bailey Circus Games from Keypunch. Designed by Subway Software (Arnie Katz, Joyce Worley and Bill Kunkel) and programmed by England's Tynesoft, Circus Games allows the user to walk a tightrope, tame tigers and try his/her luck at horse tricks amidst the clowns and sawdust. Fans of combat, on both a grand and mano-a-mano level, have several choice morsels, as well as one seven-course meal, to look forward to. On the choice morsel side, Mindscape will be releasing Cobra Soft and Infogrames' Combat Course, an innovative military training simulation with four built-in courses and a construction set option that allows users to roll their own. The playscreen is broken into three horizontal strips with the bottom level serving as command console. Each of the top two strips is subdivided into four windows. This modular set-up allows the program—and, eventually, the user—to adapt to a particular scenario. Another tasty tidbit, especially for fans of one-on-one combat, comes from Microprose's new Medalist International label. Spider Man and Captain America in Doctor Doom's Revenge by Paragon Software is not only the year's longest title but the only one to feature as many as three licensed characters in it. The program alternates beween noninteractive comic-book pages and one-player side-view fight scenes between various Marvel Comics hero and villain types. The comic-book material reads more like a Marvel stamp collection than an actual comic, with one or more new characters introduced in every panel—including several generic superguys from Paragon's own fevered imaginations. The fights are mostly standard karate stuff, with some customization. Spidey can web sling, for example, but it isn't really well-integrated into the game play. Cap, on the other hand, gets to use his familiar shield as a defensive weapon. 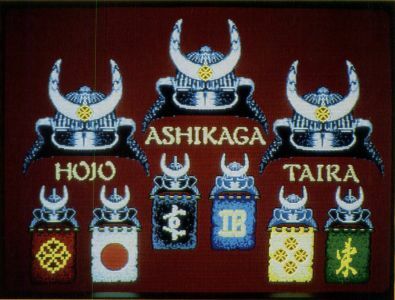 The seven-course meal referred to above is the latest entry from Cinemaware: Lords of the Rising Sun. In what looks to be Cinemaware's finest work yet, Lords combines the sweeping grandeur of a "cast of thousands" movie with a series of spectacular action and action-strategy minigames. The setting is 12th century Japan, and the subject is a family feud over the loyalty of the samurai armies that control the Nippon Empire. Lords boasts extraordinary graphics that evoke both the delicate Oriental beauty and the barbaric cruelty of that era. The action games include a scenario in which the player, armed with a sword, must deflect and redirect shuriken thrown by an advancing ninja. But the most singular and innovative feature of the games is the battlefield scenario. Employing a "magic wand" as a cursor, users command their sprawling troops over the field of combat. If successful, the victorious general then mounts a horse and pursues the defeated and fast-retreating warlord through the nearby woods. Cinemaware will also be releasing ST versions of several of its hottest titles, including Rocket Ranger, an eye-popping art deco tribute to Commander Cody and the cliff-hanger serials of the '40s. Also scheduled for ST release are The Three Stooges and TV Sports: Football. Of course, it wouldn't be a software season without a new karate title, and Mastertronic's Arcadia action line fills the bill with an ST version of the Trade West arcade hit, Double Dragon. In this popular variation on the traditional martial arts game, players move through a variety of urban and arboreal settings while battling an army of kung fu fighters. The sports category is shockingly thin this year, with a paltry three new titles announced. Fortunately, all three look promising. 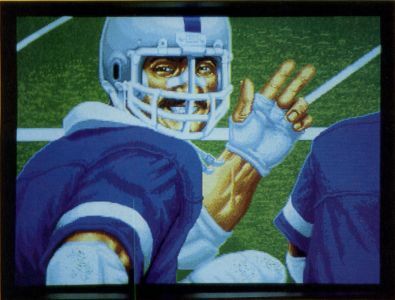 Cinemaware leads the way with its first sports entry, TV Sports: Football, a detailed and highly realistic simulation that features all the slickness and glitter of a network NFL broadcast. TV Sports: Football can be played as either an action or stat contest with graphics the likes of which have never been seen on a computerized gridiron. Mastertronic offers the European version of "football" in World Trophy Soccer, a visually impressive action contest with slick scrolling and excellent animations. And Epyx explores the world of future sports in Skate Wars, billed as "a thrilling and violent cross between hockey, soccer and outright war." There is certainly no shortage of adventure games, on the other hand, from role-playing to action-adventures and everything in between. Sierra has several ST offerings in this area, including the latest installments in the various "Quest" series. King's Quest IV—The Perils of Rosella casts the player as Rosella, daughter of the king who must make a perilous journey to obtain the sole magical item that can save her father from death. In Space Quest II—The Pirates of Pestulon, interplanetary nonentity Roger Wilco once again braves the nerdish and comical adventures created for him by Mark Crowe and Scott Murphy, known collectively as the Two Guys from Andromeda. Finally, a surprise: an adventure entry from Sierra that doesn't have a roman numeral in the title! Gold Rush by Ken and Doug MacNeill allows the user to embark on any of three great scenarios set during the great gold rush. In one, the player treks to Central America; in the second, they cross the American frontier; while the third expedition takes the watery route, heading from the eastern United States down to the tip of Cape Horn and back around to California. Also due from Sierra later this year are The Plantation Murders, Code Name: Ice Man and King Arthur. The Plantation Murders, co-authored by Roberta Williams and novelist Jackie Austin, will be an attempt to blend slapstick and suspense in a murder mystery set in a 1920s New Orleans plantation. Code Name: Ice Man is a Middle East political thriller written by former Navy SEAL Johnny Westland. King Arthur, meanwhile, will attempt to tell the saga of Camelot and the Knights of the Round Table in the Sierra animated adventure format. Role-playing fanciers will want to check out the first game in a new series from SSI, Demon's Winter. In this game, the player mounts a party and expedition to defeat the demon-god Malifon, a dude so powerful that, even while trapped inside a volcano, he was able to cast the entire world into a deep freeze. Fans of fantasy will likely be even more excited by the prospect of Mastertronic's impressive epic, War in Middle Earth, based on the writings of J.R.R. Tolkien. This epic contest combines elements of fantasy role-playing, war gaming and the animated adventure as the player strives to bring the great ring to the Crack of Doom in Mount Thunder, opposed every step of the way by Sauron and his minions. War in Middle Earth offers a 36-screen scrolling map of Middle Earth containing thousands of locations with more than 80 animated characters and armies. Gamers who enjoy Icom adventures (Deja Vu, Shadowgate, The Uninvited) will want to keep a private eye on the retail shelves for Deja Vu II: Lost in Las Vegas. In this adventure, the player is abducted by a pair of Chicago thugs, beaten unconscious and awakens in the bathroom of a cheap Vegas hotel—and that's all before the game even starts! Deja Vu II uses the standard Icom interface that eliminates the need to guess at commands since all options are available via menus. 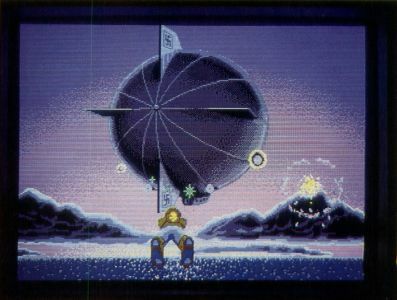 An adventure game of a somewhat different type is represented by Devon Aire in The Hidden Diamond Caper (Epyx), which uses a unique angled overhead perspective to present a series of physical puzzles. The player, as Devon, a reformed felon with educated fingers, is hired by the Widow Crutchfield to find her priceless jewel collection. It seems her late husband, world-class eccentric Montague Crutch-field, stashed the jewels in secret spots throughout the labyrinth-like Crutchfield Manor. 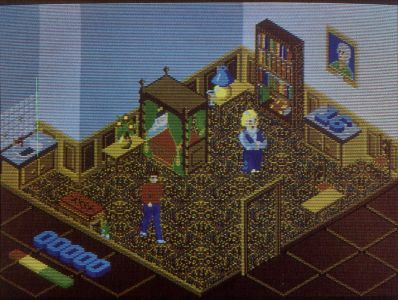 The player manipulates Devon about the various rooms, rendered in a pseudo 3-D style vaguely reminiscent of the old Atari coin-op, Crystal Castles. But the most off-beat adventure of all is Capstone's Search for the Titantic, a multistage simulation in which the user hones his or her oceanographic skills by locating the exploring undersea wrecks, then heads off in search of the most famous sunken ship of all time. Search for the Titanic features a minimum of 75 wrecks, a choice of four ships and more than 100 crew members, a variety of authentic equipment, 47 ports of call, over 100 navigational charts and enough detail to consume a computer-bound treasure hunter for hours. A small but impressive selection of classic board and card games will be available to the ST user in 1989. Sierra will offer Hoyle's Book of Cards, an Omnibus collection that features such card game favorites as Solitaire, Old Maid, Hearts, Cribbage and Crazy Eights. Board game aficionados, meanwhile, will want to investigate the excellent ST versions of Risk and Clue Master Detective. Risk, the classic strategy game from Parker Bros and Clue Master Detective, a recent revamp of the Parker Bros classic Clue, are both scheduled for a spring release by Mastertronic's Leisure Genius Line. As the saying goes, where there's life, there's hope. And in the computer business, as long as there's software, there's life. As long as the pipeline contains product, the ST will be an excellent choice for the home computer user. In case you hadn't noticed, joysticks are back. Not that they ever really went entirely away, of course, but joystick makers suffered mightily during the great video-game shakeout of the mid-'80s, and only recently began to stick their heads out of the bunker. What they found upon emerging was not the burnt-out husk they feared, but a world bustling with computer users looking for replacement controllers. Moreover, video games had not only made a comeback, but looked stronger than ever. 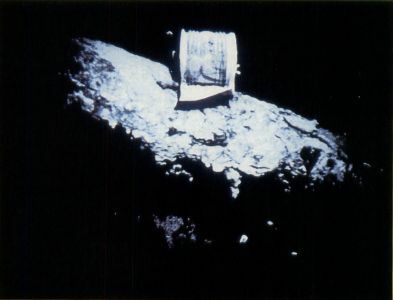 So, after pinching themselves to make sure they weren't dreaming, they dusted off the inventory, fished the R&D plans out of the wastepaper basket and plugged the assembly line back in. Joysticks were once more on the march! Leading the way in this new joystick revolution has been Camerica and the Freedom Stick, the first successfully marketed remote-control joystick. Camerica's new Atari/Commodore wired sticks are the Magnum (bubble switches), Warrior (bubble switches) and Micro Master (superior microswitches). Users who like bright colors and suction-base joysticks will get off on Beeshu's line, which includes the Atari-style Hot Stuff, a grip-handle joystick that comes in hot pink, kelly green, bright yellow and sky blue with two sets of action buttons. Then there's the Advanced Gravis Joystick Controller, a basic black, pistol grip, handle stick with eight-position centering tension control, three independent microswitch action buttons and a one-year warranty. The Cadillac of joysticks, however, continues to be the Kraft, the most elegant, durable and adaptable joystick ever made. Kraft makes two different Atari-compatible joysticks, and even the less expensive model is well made and extremely comfortable. The heavy interest in controllers right now, however, centers around a pair of highly experimental controllers from Broderbund and Mattel. Mattel showed a revolutionary new "glove"-style controller at the winter CES that analyzes kinetic action on the part of the wearer and translates it into standard control signals. Broderbund, meanwhile, offered the U-FORCE, which might best be described as an invisible joystick. The U-FORCE consists of a plastic case that opens to resemble a small laptop, but instead of a LCD screen, there is a black reflective surface. And instead of a keyboard, there is a similar surface with a hole and several buttons. The player "pretends" to grip the invisible stick and the movements of the user's hand(s) are translated by the U-FORCE into joystick-type commands. There seems to be no consensus on whether or not the joystick will remain the primary control device for entertainment software, but past attempts to move users "beyond" the familiar device have invariably crashed in flames. Remember Le Stick? How about the headband controller that helped drive Synapse out of business? The self-centering joystick possesses a familiarity that seems overwhelmingly desireable to most users and no technological advance has yet persuaded them to abandon it.